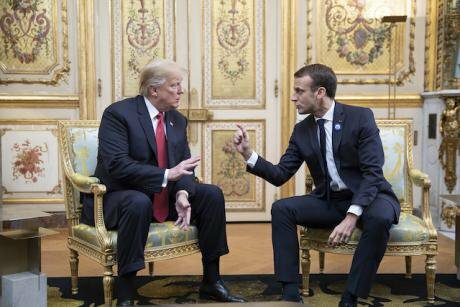 Trump and Macron bilateral at the Elysee Palace, November 10, 2018, during Centennial of the end of World War I commemorations. Shealah Craighead/ Press Association. All rights reserved. In 2017, Labour pledged to create a unified National Education Service for England “to move towards cradle-to-grave learning that is free at the point of use”, including the abolition of tuition fees. Just across the channel, in France, free education for life already exists — albeit in a state of underfunded disrepair. For us, one French and one British, this system has been vital: an opening into new worlds, a chance to reorient our lives, and a way of reviving the avid curiosity that marks the end of childhood. But the universal basis of this model is under threat. On 19 November, French prime minister Édouard Philippe announced government plans for an astronomical rise in university fees for non-EU students. Currently, where you come from does not affect how much you pay to study in France: it costs €170 a year for an undergraduate degree, a €243 a year for a masters, and €380 a year for a PhD. For students from outside Europe the government plans to increase the cost to €2770 a year for undergraduates and €3770 a year for masters and PhD students. In an ironic twist reminiscent of Trumpian policy flourishes, these fee hikes are part of a package of measures entitled #BienvenueEnFrance (Welcome to France). The government’s stated objective is to increase the number of foreign students from 324,000 to 500,000 by 2027 — by making them pay at least ten times more. From the standpoint of the elitist, fee-paying, border-policing model of UK higher education, one could be forgiven for being more shocked by the relative openness of the existing French system than by the proposed changes. And indeed, a comparison of the two models is prescient precisely because it seems increasingly clear that Macron’s government is intent on importing the Anglo-American model of higher education to France. Earlier this year, the government introduced stricter selection criteria for school-leavers hoping to go to university. This was widely seen as a move away from the essentially non-selective, comprehensive-school-style idea behind the bulk of French public universities. This principle of non-selection — epitomised by the university Paris 8, which was set up in the wake of the movements of 1968 as an experiment in open popular education — has always been undermined by the existence of the grandes écoles (a small set of highly selective elite institutions such as the École Normale Supérieure) as well as being continually eroded by underfunding. And yet this principle continues to heavily influence debates over the future of higher education in France. The government’s first two measures regarding universities — increasing their selectivity and drawing financial borders around them — signal a worrying change in direction of travel. Writing in Le Monde, sociologist Éric Fassin puts the aim of this latest measure in the clearest possible terms: “the government wants to attract the richest, and push away the poorest”. While the number of scholarships for overseas students will increase from 13,000 to 21,000, this will constitute but a drop in the ocean: the current number of foreign students stands at 324,000. And even if the number of scholarships did make up for the increase in fees, the introduction of means-testing always poses an existential threat to the principle of universal public services: once you start asking who should pay and who should not, it is a slippery slope towards privatisation. In conjunction with the insufficient increase in scholarships, Édouard Philippe stated the government’s intention to attract more students from “emerging countries (China, India, Vietnam, Indonesia) and non-francophone countries in Sub-Saharan Africa”. This is in sharp distinction to the current make-up of the foreign student population. Of the 10 countries that send the most students to France, 6 are francophone African, with African students in general making up a total of 45%. These are the students that the government is hoping to dissuade from studying in France: the young people of its former colonies. To compensate, the government is proposing to contribute towards the expansion of French higher education institutions based outside of Europe. While this may be welcomed by those who would prefer to study in their home countries, this measure comes with its problems. Not only is it a way of reinforcing the global influence of la francophonie (playing catch-up with the US and UK spread of branded universities across the world, such as UCL Qatar or Sorbonne University Abu Dhabi), it is also a way of limiting the dynamics of decolonisation at work in the former metropoles themselves. As Stuart Hall famously put it: “we are here, because you were there”. The same was repeatedly voiced by students of formerly colonised countries studying in France present at a meeting called shortly after the government’s announcement. The attempt to price out students from former colonies is a forceable off-shoring of the ongoing dynamics of decolonisation — a process at play not only in former colonies but also in the former centres of colonial power. The sheer hypocrisy of such a move is all the more striking given Macron’s internationalist posturing on the world stage. Only last month, during Trump's visit to Paris on Remembrance Day, the French president was at pains to denounce economic nationalism in favour of a vague notion of patriotism as openness. That this squares with a rise in university fees for non-European students tells us all we need to know about the exclusionary contours of neoliberal internationalism. ***Here, we are not including figures such as Frantz Fanon and others because Martinique remains, administratively, part of France.